Transvaginal Repair of a Chronic Porcine Ventral Hernia Using Synthetic Mesh. In the era of laparoscopic surgery ventral incisional hernias still remain a common surgical problem. Natural orifice transluminal endoscopic surgery (NOTES) may enable intraperitoneal access without the need for abdominal wall incisions with possible faster recovery and less complications. We tested the feasibility of transvaginal placement of a large synthetic mesh (Proceed, Ethicon Inc.) without laparoscopic support to repair a porcine hernia. Three pigs were used in this survival model. Each animal had a 5 cm hernia defect formed using a standardized technique. One month later the animals had transvaginal repair of the hernia defect. Colpotomy was performed and a 12 mm trocar inserted into the peritoneal cavity. A single channel gastroscope (Olympus 8.7 mm single channel) was used for visualization. The mesh was cut to size assuring a 5 cm overlap and corner stitches were placed in the mesh with 2-0 polypropylene. The mesh was then rolled and inserted through the trocar. The preplaced sutures were externalized using a suture passer (GraNee) and an endoscopic grasper. Additional sutures were placed every 5 cm under endoscopic guidance. Outcome measures were feasibility, operative time and complications. Mesh repair was feasible in all three pigs. Hernia sizes at time of mesh placement were 7 x 7 cm, 6 x 9 cm, and 9 x 15 cm. Time from colpotomy to completion of mesh placement was 136 min. on average. The transvaginal access was time consuming with a mean time of 60 minutes from time of colpotomy until introduction of mesh. Other difficulties included intraperitoneal handling of the mesh under endoscopic vision, fixing the mesh to the abdominal wall , and passing the suture from the endoscopic grasper to the suture passer. No intraoperative complications occurred and no postoperative complications were observed over a period of 3-7 days. 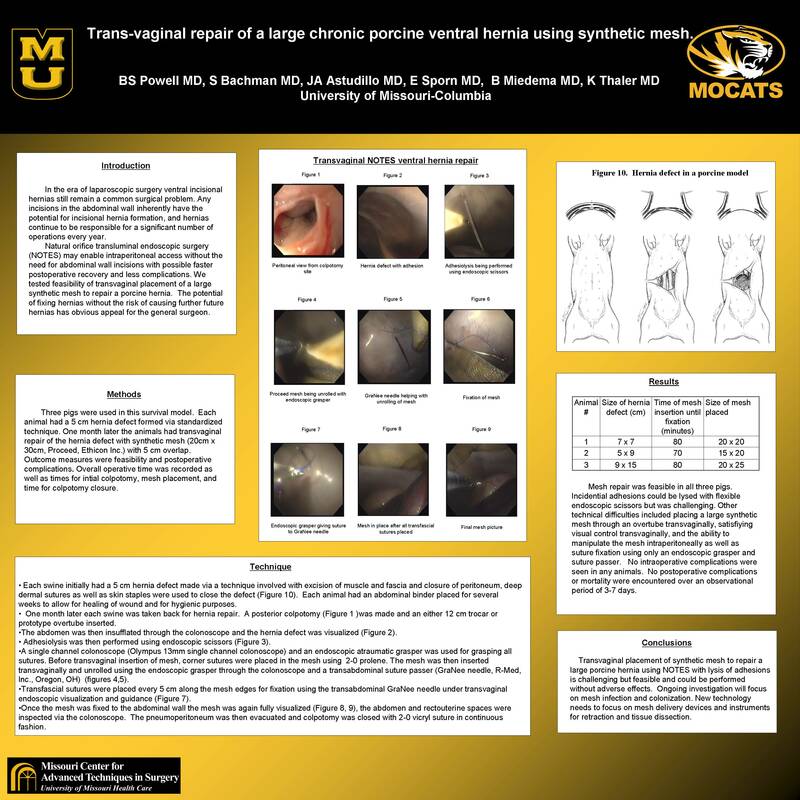 Preliminary results show that transvaginal placement of a large synthetic mesh to repair a porcine ventral hernia using NOTES is challenging but feasible and could be performed safely. Ongoing investigation will focus on improving techniques and evaluating for mesh infections.